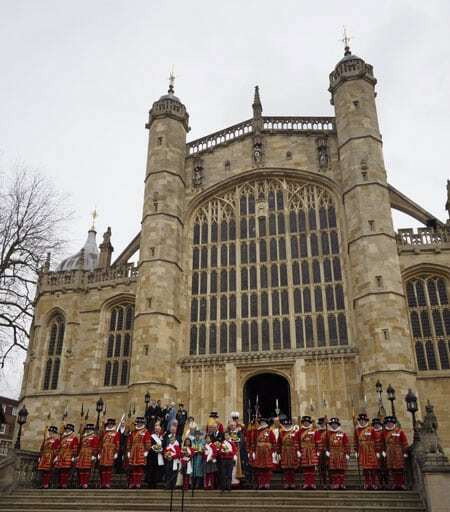 The Royal Maundy service takes place on Thursday in Holy Week each year. In 2016 the service took place at St George’s Chapel on 24 March. In a white purse – Maundy coins (silver pennies, twopences, threepences and fourpences) adding up to 90 pence (9 sets of ten pence). In a red purse – A £5 coin commemorating The Queen’s ninetieth birthday and a 50p coin commemorating the nine hundred and fiftieth anniversary of the Battle of Hastings. Both coins have been minted in 2016. Historically, the sum of £5.50 in the red purse is made up of £3 for clothing, £1.50 in lieu of provisions and £1 for the redemption of the Sovereign’s gown which, before Tudor times, used to be divided between the Recipients. In 2016 St George’s Chapel hosts the service for the first time since 1959. Though that means some 57 years since the last occasion when Her Majesty The Queen distributed Royal Maundy in St George’s, the previous Windsor occasion was approximately 600 years ago in the reign of King Henry VI. In 1423 the young monarch was just two years old and the ceremony was probably held in the 13th century chapel where the Albert Memorial Chapel now stands given that the current chapel was not begun until 1475. The photograph on the homepage shows 5 recipients in 1959. The service this year reflects, in part, the 1959 service with the opening and closing hymns being the same. Since the fifteenth century the number of recipients has been related to the years of the Sovereign’s life so this year there are 90 men and 90 women. They have been chosen for the service they have rendered to the church and community and, in this The Queen’s 90th birthday year, have been selected not from a single Diocese but from right across the country. The photo below shows The Queen, The Duke of Edinburgh, the Dean of Windsor, the Lord High Almoner, the Children of the Royal Almonry and Yeomen of the Guard and others on the west steps of St George’s Chapel following the 2016 service.